The most common type of asphalt cracks are shrinkage cracks which include longitudinal, transverse, and block cracks. Shrinkage cracks occur on the surface of pavement as hairline cracks and gradually travel further down, allowing moisture to seep through and erode the base material. This occurs as asphalt dries out and begins to shrink and crack. Shrinkage cracks measuring 1/4 inch wide or greater should be treated with crack sealer to prevent further damage to your pavement. Typically, if you can fit a pen or pencil within the crack, it should be treated. The second most common type of asphalt crack are stress cracks. Stress cracks occur when the asphalt and base are not strong enough to handle the weight they are meant to hold. If the base is soft or becomes eroded, the weight above can cause the pavement to bend producing stress cracks. 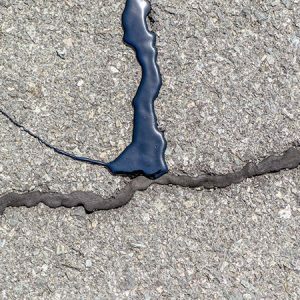 Since stress cracks do not originate at the surface, asphalt crack sealer is not the ideal solution for repairs. Over time, the formation of asphalt cracks is inevitable, but they should not be ignored. If left unchecked, asphalt cracks can cause structural damage that will only progress over time. This includes the formation of troublesome potholes and eventually destroying the foundation of your pavement. Skiles Industrial Solutions offers expert and affordable asphalt crack sealing solutions. We use the best materials and sealing methods in the industry to help protect your investment. Contact us today!